Welcome to the official Enemy Pie website! This site is loaded with resources and information for teachers, parents, and students. Please have a look around, and don’t hesitate to contact me with your suggestions, ideas, student artwork, anecdotes… anything. This is a work in progress and I’d love your input. Thank you to all the people who have put together the great lesson plans and activities you’ll find on these pages. Thank you as well to those of you that are using these resources to share the message of this book. It’s an honor to share the same values of peace, hope, and possibility. 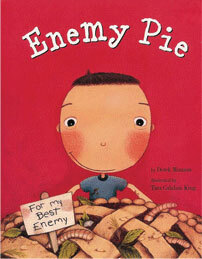 It's been over 10 years since the release of Enemy Pie, and the exciting news continues to roll in. The award winning story has been translated into many languages, was featured on Reading Rainbow on PBS, and is now in its 16th printing. For the latest news, as well as archived stories, interviews and press releases, click here. 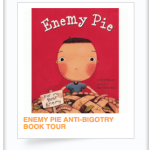 Lots of resources to choose from, including anti-bullying lesson plans, writing activities, and even Derek's own Enemy Pie Experiment! Derek Munson brings incredible enthusiasm and fun to his workshops and presentations. His teaching philosophy is simple: First, cultivate an environment where inspiration is irresistible. And second, provide a solid framework for putting that inspiration on display. Just like a Chia Pet. 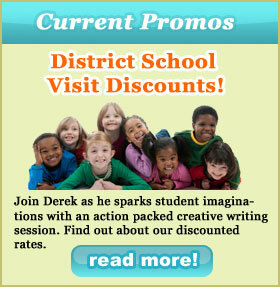 To find out more about his presentations for students K-8, click here!